MecArmyMecArmy offers innovative and dependable products. 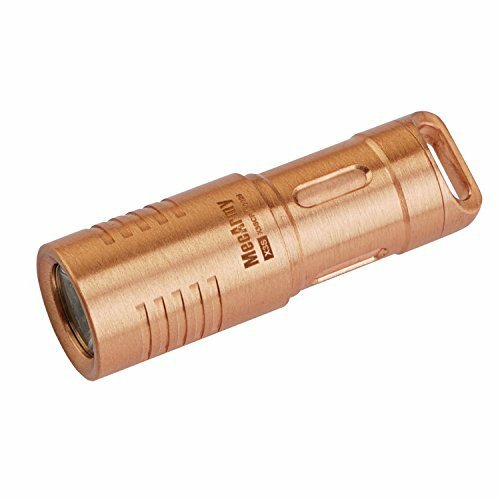 The products focus on original design, innovation, high quality and environmental protection, product categories include outdoor/tactical flashlights, handmade knives, EDC. MecArmy's flashlights are compact, with high lumen output and a USB charging interface.X3S Copper/Brass Handheld Mini Keychain EDC FlashlightMecArmy released the illumineX mini USB rechargeable light series nearly 2 years ago, which became very popular-with many copies in the market.We have now undertaken a comprehensive review of the Xseries, using our lighting and EDC experience, changing everything.Primary Features:1、Utilizes a CREE XP-G2 LED2、Made of brass or copper3、Maximum output of 130 ANSI lumens； Max beam distance of 59m4、Patented rechargeable super micro-sized flashlight5、Can be recharged without removing the light's head, you won't lose the light's head anytime6、Rechargeable with any USB port device； Quick charge in 1 hour7、Uses a rechargeable 10180 lithium ion battery8、Small and exquisite9、Reliable twist switch for quick, one-handed operation10、Battery reverse polarity protection11、Instant access to low/high mode12、Waterproof to IPX-8 Standard (underwater to 2 meters). Impact resistant up to 1.5 meters13、Use green environmental materials package boxParameter:LED：CREE XP-G2Reflector：SMOMax Output：130 lumensMax Run Time：6hMax Beam Distance：59 mMax Beam Intensity：910cdBattery：1x 10180Length：46.4mm/1.83inHead Diameter：14.8mm/0.58inWeight：Brass 18g(0.63oz), Copper 18g(0.63oz)(Excluding battery)NOTICE:Please remove the insulating sheet from tail cap before use.The above-mentioned parameters are approximate and may vary between flashlights and environments.